Place some milk in a few cups. Add few drops of edible color in the milk, a different color for each cup. 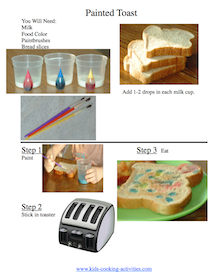 Dip kitchen brushes in the prepared color and let the kids make a rainbow over the toast. They can either color the entire bread slice or make a favorite image. Just pretend the bread is an empty canvas. Once done and when the kid is happy with the design, toast the bread. Drizzle the toast with honey and serve. This craft allows your kid to show his artistic side. With this craft, you can teach your kids about colors and how mixing can produce a new color, like blue and yellow, makes green. Download this non reader picture recipe here.